In playwright Sharr White’s quirky two-person drama, directed by Bart DeLorenzo, a formerly married couple reunites and tries to make sense of their estrangement. Married in real-life actors Nick Offerman and Megan Mullally face off in this odd-ball drama of lost love and recriminations. Pounding rhythms, colorful tribal costumes, exquisitely light and authentic African choreography, visually stunning staging and politically charged lyrics – Fela! is a biographical funk concert musical that is not to be missed! Add a charismatic and gifted performer as the central subject (Adesola Osakalumi plays Fela Kuti) and you have an exhilarating night of music and drama that will imprint on your memory for years to come. IT GOES LIKE THIS by JACK BETTS. Written and directed by veteran actor Jack Betts, It Goes Like This is a personal story, clumsily told. Leaden-footed, as if cast in concrete, the melodramatic saga manages to be both utterly predictable yet also contain enough dramatic revelations to rival a telenovela. Kevin McCorkle rigidly portrays a highly decorated general who runs his family with an iron fist. Against the protests of his gentle wife Colleece (Rachel O’Meara), he is shipping off his guitar-playing teen sons to military school so they can man up. But out of the blue he gets a call that causes his past to crash in on him. Suddenly, he’s confronted by the truth behind the loss of his brother. THE PARISIAN WOMAN by Beau Willomon. In the title role Dana Delaney transforms Beau Willomon’s middling comedy into a crackling satire that makes trenchant commentary on the abuse of power. Delaney plays Chloe, the wife of an ambitious lawyer (Steven Weber) on the short list to be the President’s pick for attorney general. Chloe is a woman of leisure. While her husband Tom is out doing whatever ambitious D.C. lawyers do, she lolls about – reading, shopping, and having affairs. A CHORUS LINE – music by Marvin Hamlisch, lyrics by Edward Kleban, book by James Kirkwood, Jr. and Nicholas Dante. In 1974, dancer/choreographer Michael Bennett asked 18 dancers why they auditioned for the chorus when the demand for musicals was in decline, there was little work in large productions, and everyone was struggling to make ends meet. Their honest answers led to the 1975 premiere of “A Chorus Line,” produced Off-Broadway by the inimitable Joe Papp. 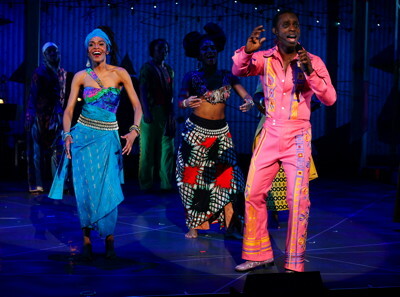 Audience reaction was ecstatic, so the sold-out musical moved to Broadway. There, it walked off with nine Tony Awards including Best Musical ‑ plus a Pulitzer. 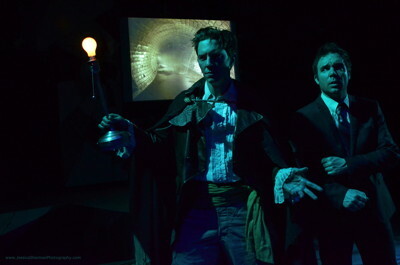 NEVERWHERE by Robert Kauzlaric, adapted from the novel by Neil Gaiman. 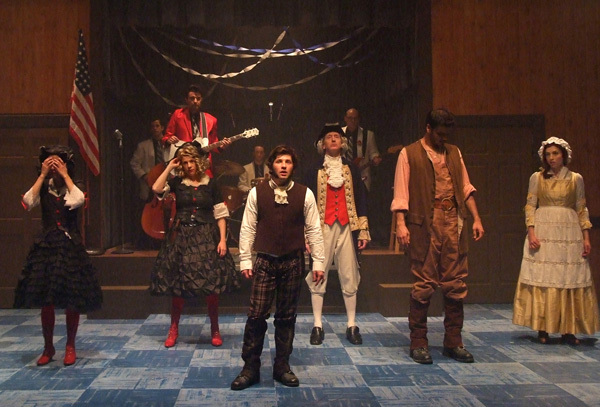 Noteworthy creativity accompanies “Neverwhere” in its ambitious West Coast premiere at Sacred Fools. Robert Kauzlaric’s adaptation of Neil Gaiman’s novel about a parallel world beneath London isn’t flawless, but director Scott Leggett and his resourceful forces turn virtual handsprings to make it play. BILLY & RAY by Mike Bencivenga. 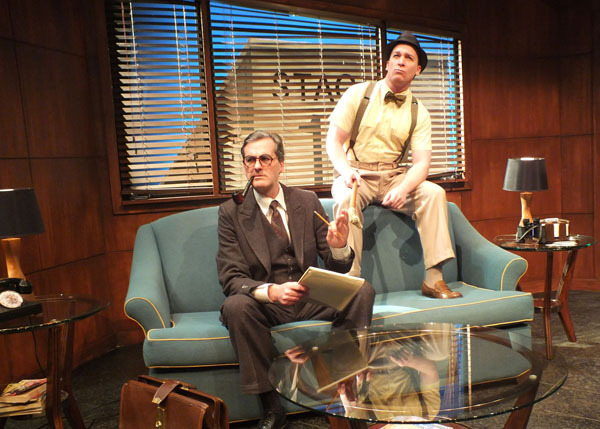 “Billy & Ray,” at the Falcon in Burbank, is Mike Bencivenga’s depiction of the collaboration between B. Wilder and R. Chandler on the homicidal film noir classic “Double Indemnity.” If you can make it through act one’s outrageous overacting, jokes that fail to land, and exposition and researched anecdotes heavy-handedly ladled out, your return from intermission will reward you with a pretty absorbing and satisfying show. 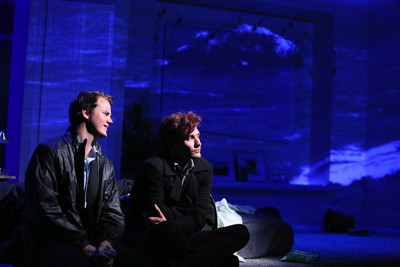 There is much to admire about the writing, and directing, of the Rattlestick production of Daniel Talbott’s Slipping. On a scene-by-scene basis, Talbott has a true gift for realistic dialogue; and, when directing his own work, he knows exactly where the pauses ought to go, to make for true-to-life conversations. But on a rather larger scale, what I really appreciate about Slipping is that, while it is definitely about its protagonist Eli, one could very well say it is about each of the other three characters as well. Marilyn – My Secret by Odalys Nanin and Willard Manus. Though iconic Hollywood bombshell Marilyn Monroe’s story has been examined and re-examined from almost every possible angle over the years, Marilyn — My Secret, Odalys Nanin and Willard Manus’ take, treads ground yet unworn as it explores the star’s bisexuality and lesbian affairs. The Miracle Worker by William Gibson. 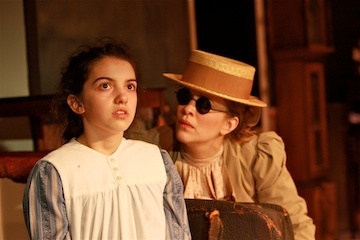 There’s always a danger of toppling into sentimentality when retelling a story as uplifting and inspirational as the saga of blind, deaf and dumb Helen Keller and her tough, determined teacher, Annie Sullivan. Playwright William Gibson avoids that pitfall by emphasizing the humor in the situation, the stubborn cantankerousness of Sullivan (Tara Battani) and the animal desperation of the child Helen (Danielle Soibelman). These actors bring visceral intensity to the battle of wits and will that erupts when Sullivan attempts to civilize the wild child, culminating in the ferocious battle over the breakfast table.